The YIMBY (Yes-In-My-Backyard) movement is fairly new. In the United States, early leaders of the YIMBY movement include Sonja Trauss in San Francisco and Nikolai Fedak in New York. The first ever Yes In My Backyard conference was held in Boulder, Colorado, in June 2016. 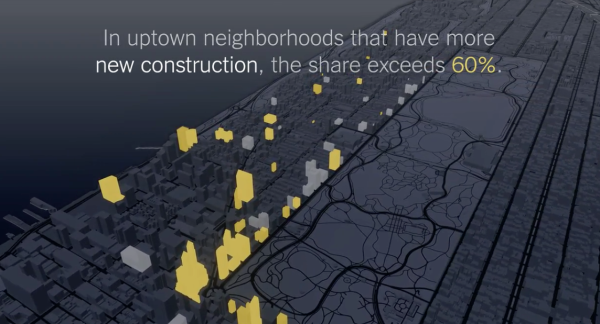 Nikolai has done an amazing job at chronicling the explosion of new development in NYC over the past several years with his must read web site New York YIMBY. One of the misconceptions with the NIMBY movement which is largely the opposite of YIMBY is the idea/rule of thumb that low-income housing always drags down property values of nearby properties. In an era challenged by the lack of any type of affordable housing, this makes a bad situation worse. According to this recent research by Trulia (FYI – I was part of their industry advisory board from 2006-2014), and notably in aggregate form, the impact seems to be non-existent in the majority of the markets covered. One can’t conclude there is no impact as a general rule but it does show that should not be the default assumption. To measure this, Trulia compared the median price per square foot of nearby homes (within 2,000 feet of low-income housing) with that of homes farther away (2,001 to 4,000 feet) over 20 years, starting 10 years before the low-income housing was built and ending 10 years after. The New York Times created another super cool graphic in their new Calculator column, based on my idea. In the fall of 2015 I observed a massive surge of sales in Westchester County (north of NYC for those not familiar with our area). However median sales price was nearly flat during this period. This was phenomenon repeated in all of the counties that surround NYC – except for NJ since I don’t cover that market yet but anecdotally I believe the same phenomenon is occurring there. I believe this moment was the point where the affordability challenge became so severe that renters and move up buyers had to move out of the city. Specifically, Brooklyn showed a surge in median sales price from 2009 with a modest growth in sales. Westchester reflected the opposite patterns of Brooklyn. Westchester county sales boomed over the same period while the growth in median sales price was much more tepid. 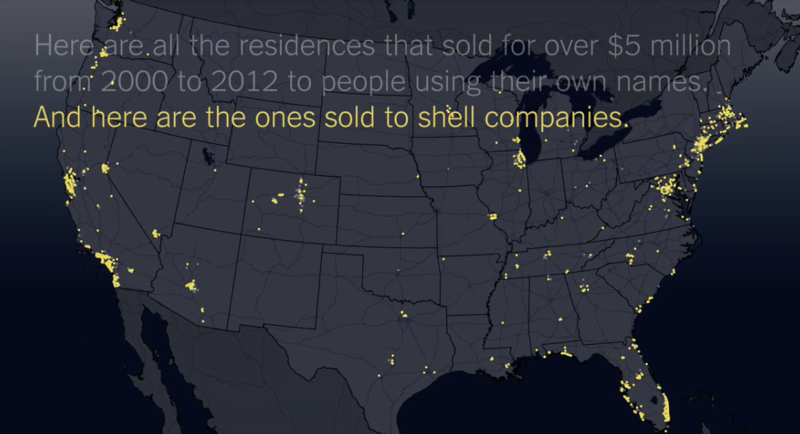 Below is the NYT graphic for the suburban sales boom article. Back in the mid 1990s after my wife and I moved to Fairfield County, Connecticut from Manhattan, I noticed the decline in housing prices further from the first express stop in Stamford, CT. I worked on an updated version of the concept for this weekend’s New York Times Real Estate section: What’s Your Commute Time Worth? They did an amazing job on the graphic. I’m liking the new goodies in the New York Times real estate section, especially this week, and not because the most recent market report on the Manhattan, Brooklyn and Queens rental market for Douglas Elliman was featured. No, really. There has been voluminous discussion in recent years about following and marketing to the high end of the demographic scale, especial the real estate market. It’s been the focus of much of the new housing development action of the past five years, especially in big U.S. coastal cities. The high end development market has been widely chronicled here and within my weekly Housing Notes newsletter. And as the rich own a greater share of real estate, major cities like New York, Los Angeles and London are going through a kind of “resortification,” familiar to posh beach towns or ski resorts, as their populations become more seasonal. For Manhattan, these birds are rare in February and squawking on all treetops (bad pun for super tall condo penthouses) at full capacity in June. And no, I never liked that band. UPDATE: The following article made the front page of the NYT today, my 13th A1 appearance (but who’s counting?). 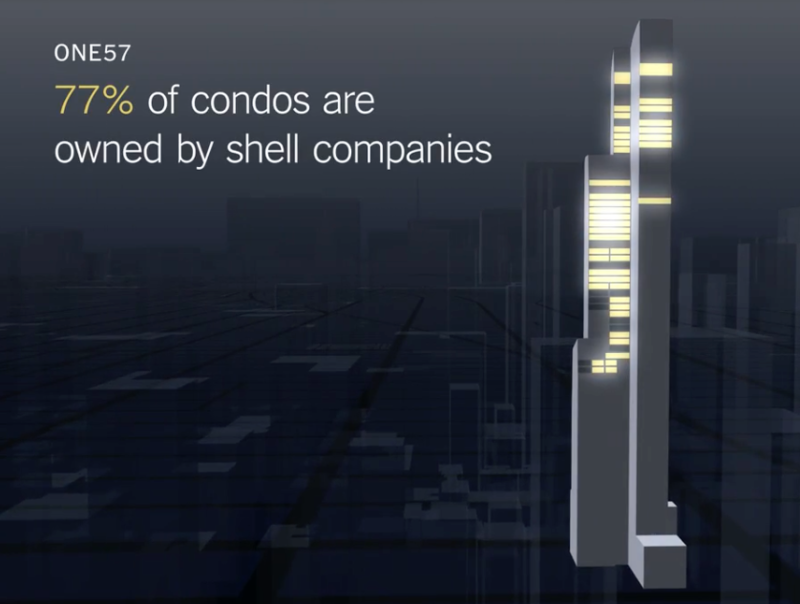 New York Times’ Matt Chabin writes a piece about the “Super Tall” phenomenon on Manhattan’s West 57th nicknamed “Billionaires’ Row” called Developers of Manhattan Spires Look Past 1,000-Foot Neighbors. The changing skyline is a well worn and controversial discussion throughout much of Manhattan’s storied (pun intended) real estate history. It’s quite amazing to appreciate how much the skyline has changed over the past century, nearly always moving taller. In the current iteration of growth, the potential benefit seems to be the financing of affordable housing. Are the Chinese flooding the U.S. market now or are they pulling back? Which is it? Or is it both? In my recent trip to Shanghai, I spoke to and interviewed many, many real estate investors at The Real Deal Forum. I got the impression that investment has pulled back a bit in 2015 but expectations were high that investment would expand again, although not to the level of the past 5 years. Of course I was doing this in a biased environment – at in investor conference. I was consistently told that government efforts to prop up the stock market spooked much of the smart money out of the market since the actions were taken to calm everyday investors. The New York Times piece seemed prompted by a P.R. pitch from the Chinese developer for their Dallas suburb project enticed with a suburban angle. It was a refreshing angle since Chinese real estate investment in the U.S. has been an urban narrative and specifically focused on the high end. The article illustrated just how massive the investment patterns have been. To date the narrative has been focused on super luxury condos in expensive metropolitan areas, while the suburbs got limited attention. The WSJ article is more orientated towards the past few weeks while the NYT article is a longer term view. Both publications place emphasis on NAR’s Profile of International Home Buying Activity whose results emphasized the Chinese investment surge of the previous year. The survey results only reflect the market through last March, so it is 9 months behind the current market. The Chinese investment numbers are staggering, and they are probably understated. Since the NAR report is simply a survey of it’s members and NAR has limited exposure to New York City, especially Manhattan – a hotbed of Chinese real estate investment activity. Incidentally, do the above 2 charts look similar? They both relied on the NAR report. The NYT piece set the table on the entire multi-year phenomenon using a ton of cool charts while the WSJ attempted to illustrate the change in recent weeks Both outlets were forced to rely on a lot of anecdotal to make their case. Both articles are consistent with my views as each provided a different context. The NYT piece provided the long term historical view and the WSJ was a short term snapshot. To keep the sales going, developers in the massively bloated Chinese housing market are getting more creative. This NY Times short documentary is fantastic and surreal. I’d chalk it up to simply bizarre, if there wasn’t such a desperate undertone to it. It reminded me of “The Truman Show” movie where everything Jim Carrey’s character saw was fake, made for him. However in the Chinese version, everyone knows it’s fake but embraces it. With the massive oversupply, no wonder savvy Chinese investors are extracting as much wealth as they can and investing overseas in anticipation of that day of reckoning. One of the great ironies of modern residential real estate has been the expansion in transparency of information, along with greater secrecy of ownership. I think the latter coincides with the much greater wealth that is being put into hard assets like real estate. Privacy and security are indeed very important to many, including the wealthy and especially those near the top of the financial pyramid. There is nothing sinister or unseemly about the desire for privacy. The use of limited liability corporations (LLCs) has been a legal vehicle (and a gift) from lawmakers who created it that allows people to keep certain transactions hidden from view. However the LLC also provides an opportunity for bad actors to shelter their often ill-gotten assets too. Louise Story and Stephanie Saul of The New York Times have explored this in “Towers of Secrecy: Stream of Foreign Wealth Flows to Elite New York Real Estate,” an epic data visualization along the lines of “Snow Fall: The Avalanche at Tunnel Creek” This article is a must read covering the hypersensitive subject of high end real estate and privacy. The ongoing debate about the dying middle class versus the booming fortunes of the wealthy, the lack of affordable housing versus the super-luxury residential tower boom and municipal governments grappling to keep construction and development moving forward to keep tax revenue flows coming in, have made this effort long overdue. “Towers of Secrecy” is careful not to stereotype users of LLCs in high end real estate transactions as exclusively foreign buyers. Within the Manhattan market, foreign buyers are not the majority of overall high-end real estate purchasers. However they tend to be concentrated around the Midtown central business district (aka ‘Billionaires’ Row’) whereas domestic purchasers tend to favor markets found to the north and south of Midtown. Here are a few screenshots of the embedded videos within the “Towers of Secrecy” piece. A few months ago there was a record $70M sale of a penthouse co-op sale at 960 Fifth Avenue. The purchaser paid $5M over list price. 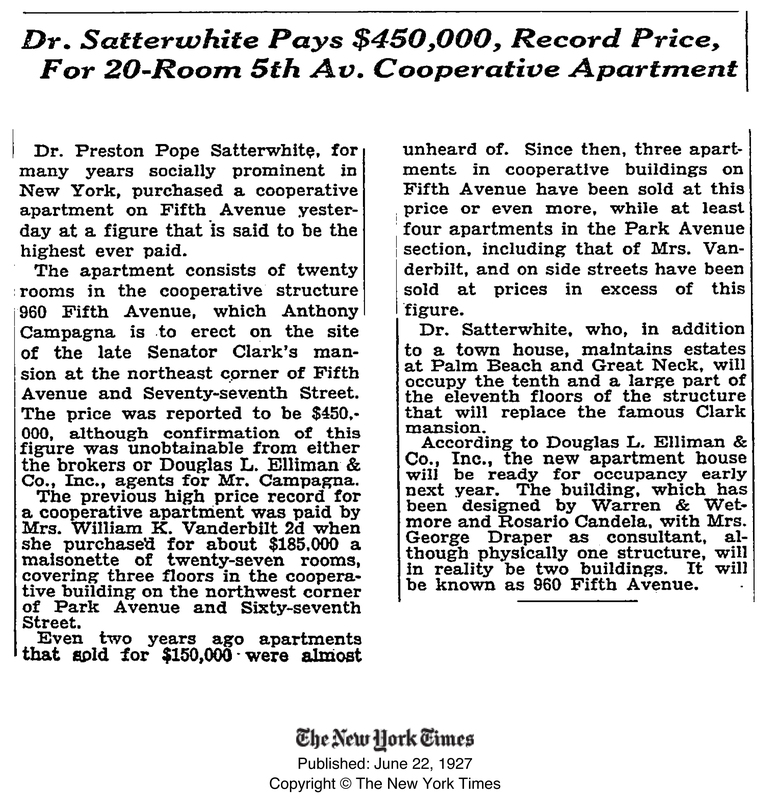 While doing some research I ran across an article in the New York Times archive that described a record Manhattan sale of $450,000 in the same building in 1927. The apartment was located on the 10th and most of the 11th floor in the same building (aka 3 East 77th Street). Based on the unit description, I believe this to be Apartment 10/11B which last sold for $21,000,000 on July 24, 2013. Using the BLS calculator for CPI, a $450,000 sales price in 1927 adjusted for inflation to 2014 dollars would be $6,164,043 or an increase of 1,270%. However the apartment sold for $21,000,000. an increase of 4,567% or 3.6 times the rate of inflation. Many have complained about the Federal Government’s (and our society’s) overselling of homeownership over the past decade and how the decline in homeownership will eventually lead to an emphasis on rentals in the US. Of course, like many housing market ideas, good and bad, they tend to be presented in a vacuum, without real context. I believe much of this discourse is in reaction to tight credit combined with a weak economy rather than some sort of fundamental cultural and economic shift. During the bubble we got the opposite discourse – that there was a fundamental cultural and economic shift towards homeownership. Currently there is a much smaller subset of Americans that have access to financing. According to the Federal Reserve Senior Loan Officer Survey, lending has actually tightened in 2014 over 2013 (related to QM). Many homeowners are unable to sell because they can no longer buy and many renters no longer qualify for financing so the idea of of homeownership as a goal fades. Case in point has been the recent public discourse on the issue of home affordability, whether it be sales or rentals. Zillow presented an analysis for the New York Times that illustrates how much rents have risen in the past 13 years (since 2000) in cities across the US. The economy is weak – we are seeing tepid growth in employment, stagnant incomes and historically tight residential mortgage lending. Approximately 38% of homeowners can’t buy their next home so they won’t list their home for sale. Buyers without credit issues won’t list their homes until they can find something to buy. The lack of supply presses prices higher because those who have access to credit have little inventory to choose from, driving up prices. Renters looking to buy can’t find a home they want to purchase so they are kept in the rental market. Renters looking to buy don’t qualify for a mortgage so they stay in the rental market. The organic flow out of the rental market into the sales market is slowed and a log jam is created of too many renters and not enough buyers. Rising rents against stagnant incomes creates an affordability crisis. The sales and rental markets are connected. They are not mutually exclusive. Rising rents are a product of tight credit, which is a residual byproduct of the financial crisis. Fix the economy and credit eases, then lending normalizes (no, not circa ’06) and the pressure on rental housing is eased. – Zillow was launched circa 2006 and rents are not public record so the early data has to be super thin. – The comparison was made between a first quarter (low) and a third quarter (high) in a highly seasonal market. – I am not sure if “New York” means Manhattan or New York City. If it is Manhattan, then our median rent figure in 1Q 2000 was $2,600 in nominal terms, and $4,276 in real terms. In nominal (unadjusted for inflation) terms, rents have risen 23.1% through 3Q 2013 while real median rent has fallen 27.3%. The Zillow median rent as share of median income nearly doubled, rising from 23.7% to 39.5%. Either incomes have collapsed in NYC or the 2000 rental figure being punched into their model is flawed, ie way low, no? Other inights on any of this would be appreciated. Jonathan Miller on China: A Housing Market Without Re-sales?